This new and modern beach house will bring fun, relaxation and enjoyment for all.. Perfect for a large /or a Group of Friends.. Take a 5 minute walk to the pristine sands of Peregian Beach and soak in the natural surrounding beauty of this area… or Lounge at home with cool ocean breezes and chill on the beautiful deck looking into the inviting 12 metre lap-pool. The lap-pool has the Enviro-swim water purification system that cares for the environment and creates water that people love to swim in. No skin & eye irritations and great for sensitive skins. The property is situated in a quiet street at popular Peregian Beach, and close to all that the very best on offer from Noosa, Coolum and surrounds. There are ocean views from all 3 levels of this home.. 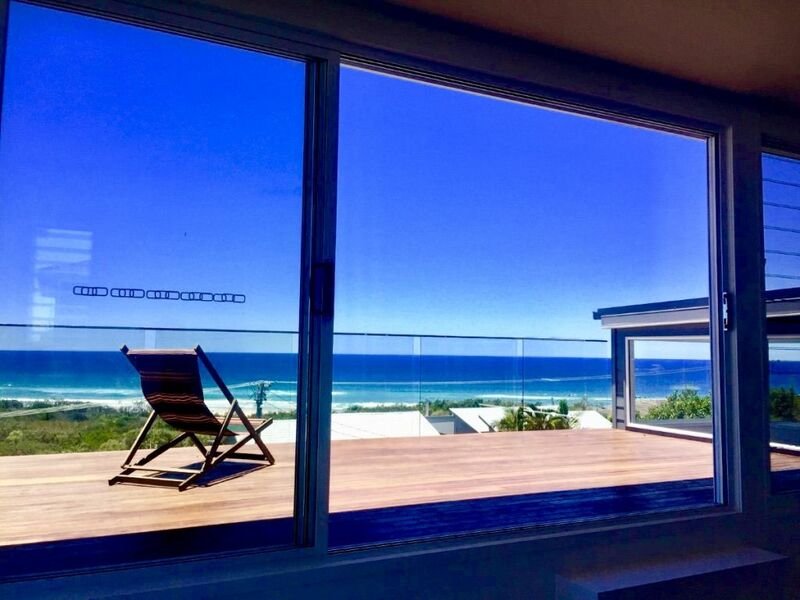 Entertain on the top level lounge with a stunning vista from the top level balcony with views across to the Noosa National Park and Sunshine Beach. Colours of Blue & Green will captivate the senses…Enchanted evenings on the deck awaits… You can also study the waves to broadcast your own beach catch the seasonal whale migration.. This property can comfortably sleep 10 with 5 bedrooms including 3 ensuites, 2 kitchens,3 balconies, 3 Lounge rooms, 4 bathrooms, Inside / outside deck. The house is fully air conditioned and all rooms and living areas have top quality remote controlled fans with summer /winter settings. Level 3 has spectacular views all the way to Sunshine Beach and is literally in the clouds. Level 3 Master Bedroom & Ensuite with beautiful feature timber bedhead wall and Luxury King Sized Bed. The Bathroom has great Ocean views for those voyeurs who do not wish to use the blinds! Relax in the bath-tub and take in the views with a glass of bubbly! Level 3 Lounge includes TV as well as bar and fridge to entertain.. walk up the New York style Donna Karan stairs to the beautiful outside deck with the views to die for..
Level 3 is PERFECT for a Private Retreat! Level 2 : Master Bedroom & Ensuite with Luxury King Sized Bed. Large bathroom and walk in robe. Bedroom 3 with 2 x Long Singles that can be put together for a King Sized Bed. Main bathroom with dual access from within and pool access. Neatly tucked Laundry with washer, dryer, large sink & bench space. Modern Gourmet Kitchen with Miele Oven & Gas Cooktop, Large Stone Top Benches for Food prep and breakfast bar. Open Plan Lounge with TV and FOXTEL access, IPOD dock music player, DVD player. Covered Deck overlooking the 12 metre lap pool. Level 1: Optional Full self contained area including Bedroom Ensuite with Queen Bed, Lounge & Fully Equiped Kitchen, front deck for cool breezes and view. Strictly no parties/functions as this is a residential neighbourhood. Absolutely gorgeous house. World class view! Thanks for staying at our beautiful beach house Damien. It was a pleasure to have you stay. Glad you found it so convenient to the beach and the shops. It sounds like you enjoyed the spaciousness of the house as well as the amazing views of the ocean and it suited you and your family perfectly. Glad you enjoyed our beautiful Enviroswim 12m Lap pool, it’s like swimming in fresh water! Thanks for the great review Damien and hope you can stay again soon. We stayed for a long weekend. The house is all new, tastefully decorated, great views of the ocean. 2 lovely big balconies to enjoy an afternoon drink. A quick walk to the beach. Walk to the shops/restaurants is about 25min (5min drive) but a pleasant walk either along the beach or quiet road. So glad you enjoyed staying at our beach house Michele. Hope to see you again soon. Whilst we respect this guest’s feedback we wish to explain the circumstances. Damages were caused to items with one assessed to be unrepairable initially.. Bond was withheld as the cost to replace this item was greater than the bond. This guest & his friends also decided to move heavy furniture up to the top level. The neighbours reported a Disco party that went well into the night.. the furniture was not moved back.. There were other indiscretions..e.g. a broken display ukulele, running the pool waterfall virtually non-stop… Enormous time, energy, and frustrations were expended by us in dealing with suppliers and the manufacturer to minimise costs.. It took time but we persisted and finally got a better outcome for our guest.. this allowed us to then promptly refund a substantial amount of bond.. It is disappointing that this guest was not appreciative of our efforts, and our goodwill in overlooking some indiscretions.. Regardless, we were glad to hear that this guest and his friends had a wonderful stay at our house! Great property for our family of 6 adults and 2 children. We spent all of our time in the covered deck with the beautiful cool breezes from the front. Bedrooms and bathrooms are huge. Great open plan kitchen, dining onto the covered deck. Even though it was hot we did not need to use tha A/C - fans were sufficient when required. Would recommend for large family groups. Views, location and house absolutely amazing - perfect for our family holiday for 7 adults and two children.